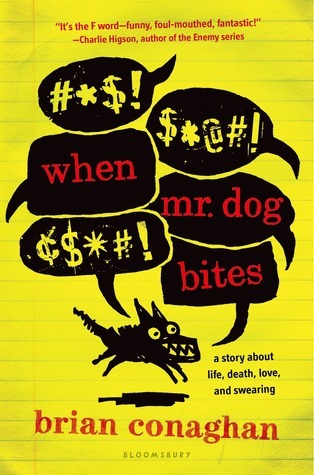 I've worked with boys with Tourette's before, so I wanted to like this book, but I just didn't. It was too disjointed and didn't seem realistic to me at all. I was lost in this novel. A lot. Maybe it was the Scottish slang, the random swear words, or the almost stream-of-conscious way Dylan thinks, or maybe it was all of the above. I couldn't keep up from one jump to another. Dylan also seemed extremely immature for sixteen, but there was no evidence that he had any sort of developmental disability. I don't mind some swearing in novels, and I understand that swearing is sometimes a tic associated with Tourette's, but there was just entirely too much of it to be realistic. Despite popular stereotypes, swearing is actually one of the rarest kinds of tics. This novel does nothing but perpetuate the stereotype. I was annoyed enough with this one to give up before I even learned if Dylan was actually dying or not. Maybe it's just not the right book for me. I'm not even sure who it was written for. Are there any Scottish slang-knowing, swearing-obsessed, immature teenage American boys reading my review right now who want to give it a try?